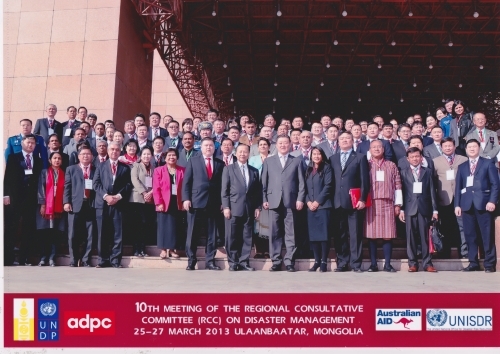 To reflect on the past achievements of RCC meetings and provide guidance on the future of RCC within the context of a post-2015 framework for DRR and post-2015 sustainable development agenda, as well as with other regional and global initiatives, including the proposed GIZ Global Initiative for Disaster Risk Management. Recommendations and progress of outputs from the 5th AMCDRR were shared. These points demonstrated the linkages between AMCDRR and the RCC, and the way forward including an update on the preparation for the 6th AMCDRR in Thailand. The linkages between the recommendations stated within the outcome document from the 5th AMCDRR conference, the Yogyakarta declaration, and the objectives of RCC were also discussed. Part of RCC10 discussions included how to accelerate the implementation of the HFA through undertaking priority actions for integrated DRR, CCA and Sustainable Development planning at the local level. These talks took place in three parts: i) identifying the issues and options related to local level integrated DRR, CCA and sustainable development planning in Asia; ii) country presentation on disaster risk assessment: local-level methodologies, issues and options; and iii) country presentation on the application of risk information for local-level integrated development planning: practice, issues and options. Some of the key options highlighted were: strengthening of livelihoods through promotion of employment and measures to increase agricultural productivity, promoting water and food security and marketing initiatives and improved ecosystem management. Discussions during the meeting suggested specific actions that can be taken to accelerate the HFA over the next two years and identify the issues that could hinder action. Discussions highlighted some of the key challenges in accelerating HFA implementation, for example, the local government authorities in the development sectors in many cases do not have the mandate for DRR-related activities and without this official mandate, doing capacity building and awareness raising is not enough. Also, it was felt that decentralization of DRR and development responsibilities would be a key step towards more integrated planning and action at the local level, and referring to resource allocation mentioned that we must create the mechanisms towards achieving. During RCC10 group discussions on key questions related to identifying the linkages between the post-2015 DRR Framework and development agenda led to the development of a Regional Action Plan for DRR 2013–2015. During the meeting the identification of specific inputs from representatives towards global dialogues on linking post-2015 DRR framework with the post-2015 framework for DRR development agenda, to ensure stronger linkages between DRR, CCA and development in the future, led to the identification of specific inputs from RCC member countries; especially, Cambodia, Pakistan, the Philippines, and Viet Nam. They shared progress of the consultations for the post-2015 framework for DRR and development agenda and the recommendations resulting from the consultation processes held in their respective countries. Past achievements of previous RCC meetings that can provide guidance on the future of RCC within the context of a post-2015 DRR framework and post-2015 framework for DRR, was reflected on through sharing mile stones of previous RCC meetings. These include: Bangkok RCC2 declaration of 2001 on future directions for regional cooperation; Hanoi RCC5 statement on mainstreaming DRR into development; and Manila RCC8 statement on implementing national programs on CBDRR in high risk communities. The RCC website provides information on the RCC mechanism; background, members, past meetings, RCC program. It acts as a hub for the RCC members on information related to the RCC and provides an archive of proceedings of previous RCC meetings, country presentations and publications. Website administration is handled by the Asian Disaster Preparedness Center (ADPC). Copyright © 2019 Regional Consultative Comittee on Disaster Management (RCCDM). All Rights Reserved.